a beer blog about portland, oregon and all the wonderful craft beer in our fair city. we're craft beer ambassadors & beer geek enthusiasts; we meet up over tasty beers. some of us homebrew, a few of us are pro brewers, some of us are hobbyists, and some are firmly entrenched in the portland craft beer scene! It's a bit over the top! Our friends over at Fort George are at it again. 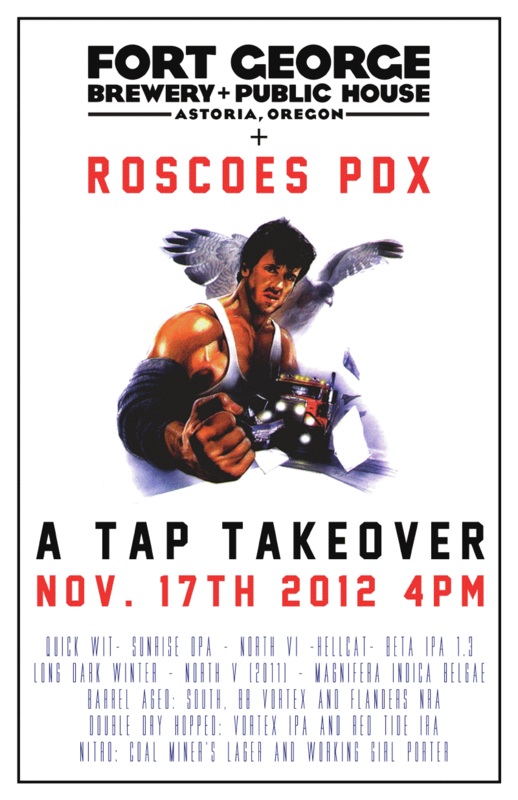 This time with the largest Fort George tap takeover outside of Astoria at Roscoe's! 15 taps of Fort George beery goodness. Party starts at 4 pm. Free FG schwag to the first 50 people in attendance, Also, see the answer to the question, will they let a 100 pound malamute into the pub? Come hang out with the FG crew and get your beergeek on!